. : Farm Forest Line - Soil Compaction & Nutrient Decline :. Damage to soil structure and loss of soil fertility threatens the viability of many agricultural landscapes. Although the addition of fertilisers and trace elements can be used to offset losses in soil nutrients, the fertility of soil also depends on its organic matter content and structure. Nitrogen fixing tree species offer some potential to enhance soil fertility over and above any possible impact the trees might have on soil structure or organic mater content. 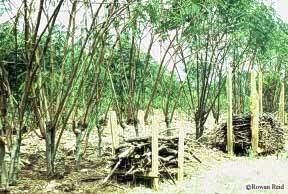 The photo above shows the use of Leucaena, a tropical nitrogen-fixing shrub, being used for fodder, fuelwood, soil erosion control and nutrient supplement with a maize crop in Kenya. 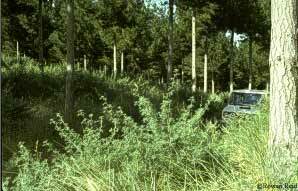 Nitrogen fixing tree shrubs have also been used in pine plantations grown on low fertility sandy soils to boost the nitrogen levels. Possibly the most valuable contribution trees can make to soil fertility is through the transfer of nutrients from the sub-soil to the surface soil. This can occur through litter fall or as a result of fine root turnover (the growth and death of the fine feeder roots in the surface soil). Research in eucalypt forests suggests that a large proportion of the nitrogen, phosphorous and potassium, and 100% of calcium taken up by trees will be dropped on the surface soil as fine litter (leaves and branches). Because most tree species actively extract nutrients from the leaves before they shed, pruning or harvesting of green branches can further increase the cycling of nutrients. Nutrient cycling may be an important means of recovering leached bases (including calcium) and nitrates from under pastures, which are the primary cause of soil acidification. Organic matter binds with soil nutrients, stores water and enhances soil structure and drainage. Maintaining or building soil organic matter levels also contributes to the control of greenhouse gases. Conversion of forests and woodlands to pastures commonly leads to a reduction in soil organic matter content. This is further reduced if the land is cultivated in any way. Although this would suggest that re-establishing a forest on farmland will lead to a build up of soil organic matter, this may take many years. In fact, if ripping or cultivation is used to establish the trees, the soil organic matter content might actually drop before the trees are able to begin turning over litter and rebuilding the soil.